Psychonauts Dev Would "Love to Revisit the Franchise"
A lack of funding is keeping Psychonauts from getting a sequel. Double Fine's Psychonauts launched to critical acclaim in 2005, but poor sales kept a sequel from ever becoming a reality. 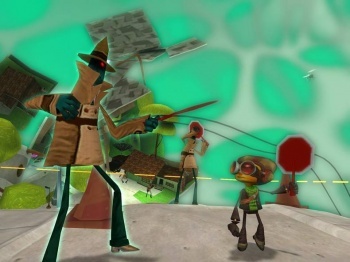 The game has gathered a huge fan following since then, and Double Fine's Greg Rice recently stated that a Psychonauts sequel was the developer's most requested game by fans. Calling the requests "flattering," Rice said "it's something that we'd definitely be interested in doing." Due to the expensive nature of making a large retail title like Psychonauts 2, though, Double Fine would need a lot of financial support before it's possible. "It's not so much that we'd make games to make money, the real issue is having the money to make the game," Rice explained, adding that Double Fine would need "a ton of money" in order to pay its developers to make the game over a period of several years. The developer got around this problem when they launched the Double Fine Adventure Kickstarter, after which gamers threw money at the game. For Psychonauts 2, however, Double Fine would likely need a whole lot more than their $400,000 DFA Kickstarter goal, or even the $3.3 million they eventually raised. This isn't the first time a Psychnauts sequel has been addressed; earlier this year Minecraft creator Markus "Notch" Persson reached out to Tim Schafer on Twitter and offered to fund the game, though that appears to have fallen through. Though Psychonauts 2 isn't in development, "there are definitely more Psychonauts stories to be told," according to Rice, and potentially fans could someday get the sequel they've wanted for so long.